United Wire Hanger/UWH Industries of Hasbrouck Heights, New Jersey, was founded in 1962 by three brothers - Larry, Joel and Bert Goldman - to manufacture and distribute wire hangers for the dry cleaning, laundry and apparel industries. In 1970, they expanded to service the uniform rental industry. 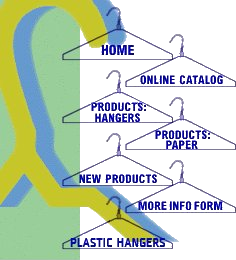 Uniplast Industries, an affiliate company, was founded in 1973 to manufacture and distribute plastic hangers to the apparel and retail industries, servicing the largest retailers and apparel manufacturers worldwide. United Wire Hanger/ UWH Industries/Uniplast Industries now have active second and third generation officers and sales personnel, including Peter, Stuart and David Goldman, and many of the employees have been with UWH for more than 25 years. Both the company-owned 200,000 sf modern distribution facility in Teterboro, New Jersey, and our west coast distribution facility in Los Angeles, have for many years helped give excellent service to many of the large national companies in our industry. UWH is very proud of some of their very long-term relationships with these companies. “Many of our relationships in the industry were formed during the many TCATA annual conferences we have attended during the past fifty years,” stated Joel Goldman, CEO. “In addition to the conferences, the excellent TCATA staff has kept us informed on important industry issues and governmental regulations that are so vital to our business. TCATA has certainly been a worthwhile investment and we are proud to say we have been members for fifty years,” he went on to say. Our mission is to serve our customers, employees and shareholders by being the leading supplier of Plastic Hangers, Wire hangers, and related paper products, to the industries we serve, through innovation, product excellence and service.